Janet B gives us another chapter in the continuing saga of Fr. Adrian "The Fugitive" Cristobal. "The Fugitive" is gone but not forgotten. "Like Aaron Quitugua in my last post on this subject, Lamberto Legaspino was a young man who wanted to be a priest for Guam. The attached letter from Adrian to Apuron shows the evil heart of these Church “leaders”. Try not to become enraged, as I did, when you read how cold hearted these men are about the calling of God to Mr. Legaspino. 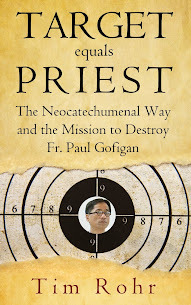 Together they conspired to reject his request, because “It is almost a guarantee that we will have new [NCW] seminarians every year and so there is no need for us to consider an extra application.” Do not be fooled as to who is behind this effort. Adrian slyly says “we” do not need to consider his application, and “Perhaps you would like me to write” him a rejection letter. This is all Adrian’s doing, and he wants to make sure his hapless bishop doesn’t blow this chance to kill a vocation. Adrian will write the letter himself because he actually takes joy in suppressing the vocation of anyone not in the NCW. Some may say Mr. Legaspino did not have a true calling and Adrian and Apuron could see that. But this was not the reason he was rejected according to their own words in 2004. Besides that, the calling did turn out to be authentic, and Lamberto had a true calling. He was not deterred by Fr. Adrian, and went on to become a priest elsewhere. But Fr. Lamberto Legaspino still loves Guam, and was here a few years ago for the Santo Nino mass and procession. Per the website he is dearly loved by his parishioners. Another great opportunity lost. Thanks Adrian! It is likely that these two leaders, responsible for the denial of countless vocations, have violated Canon Law as well. Since we the people of this Archdiocese have spent a fair amount of money to try and educate Fr Adrian in Canon Law, maybe he can tell us which canon laws he and the former bishop have violated? Fr. Lamberto Legaspino is one of how many men from Guam who were tossed aside because the desires of the NCW to rule the Church on Guam. How many true vocations were destroyed by Adrian and the NCW?" Guam's Catholics have certainly suffered over the years. Fr. Adrian (The Fugitive) was a big part of that suffering. The glimmer of light from this dark cloud is the awakening of people and the efforts to defend our Church. Although it will take years to repair and rebuild the result will be a stronger Church. 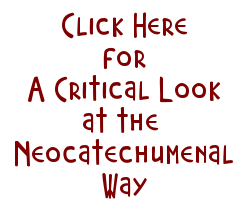 While in the NCW it was constantly drilled into our heads that the vocations were the fruits of the NCW. Our Responsibles would tell us that before the NCW there were no vocations. We heard it so often we began to believe...silly us! Now that I am no longer under their spell, I can see clearly the lies they feed to their members. 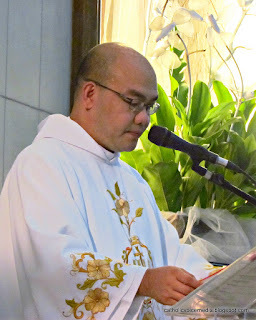 I can see that on Guam we have 30-40 local priests, and only one of them came from the NCW, Fr Louis Camacho, who can no longer be a priest because of his indiscretion with a teenage girl in a parked car in Agat. All the vocations we have are thanks to the Capuchins, or diocesan priests who nurtured the calling in young local men. Like Janet B, I am also sickened to think that we lost countless vocations because the NCW did not want competition. like all of us who bought in to the ncw we have to accept the consequences of our actions! Glad to be out -YES. But sad for all the others we influenced while we were in! We need to pray for our brothers still under their influence and ask forgiveness for our part in their entrapment.